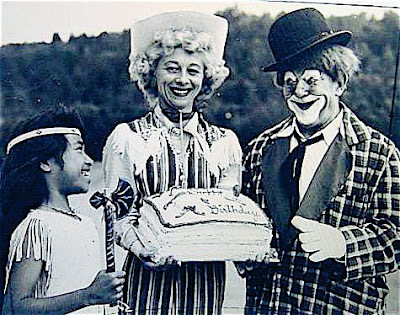 Poodles Hanneford is given a birthday cake by his daughter Gracie and a young fan at Frontier Town in North Hudson, NY on June 14, 1961. 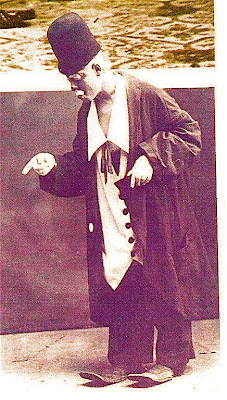 A classic of the burlesque stage as presented by the Saturday Afternoon Kung-Fu Double-Feature Matinee Comedy Theater. "Your Punchline Is Strong, But It Is No Match For My Spit-Take!" Shane and I saw Indiana Jones and the Kingdom of the Crystal Skull yesterday after school and I was surprised to learn about the ancient practice of skull modification. The Peruvians would bind their infants' heads in order to stretch them out, making them "more pleasing to God". Now who do we know who looks like that? Were these ancient Peruvians onto something? Might they have created a society extremely advanced in engineering and farming by gaining favor with their worship of midget cars and hunting gags? Any expectant parents out there want to try this binding thing out? Possibly form a New Age cult of "Lou-therans"? More "loving tribute" and "hip, counter-culture parody" than yesterday's postmodern deconstruction of Abbott and Costello's "Who's On First", this one comes to us courtesy of Second City's Tony Rosato and Eugene Levy from SCTV. 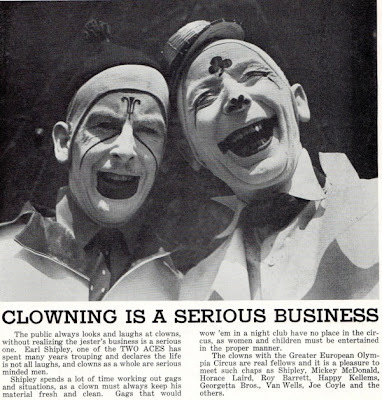 although the text quotes Earl Shipley, I don't believe that Earl is either of the two clowns pictured. 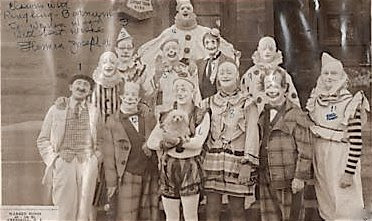 A photo of members of the Ringling Bros. and Barnum & Bailey Circus Clown Alley taken in Binghamton, NY not too long after those two huge shows combined. 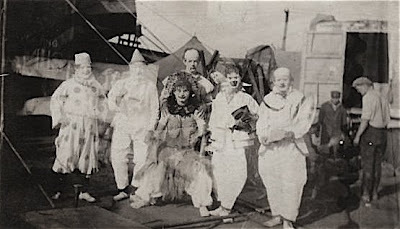 Pictured are: Herman Joseph (in moustache), John Slater, Frank McStay, Pauline, Spader Johnson, Danny McPride (with dog), Al Sylvester, George Hartzel, Murphy, Tom Hart, Roy Barrett and Everett Hart. Yesterday I had the opportunity to play Frank "Slivers" Oakley in the video for Rachel Sage's song "Vertigo" from her new album Chandelier. 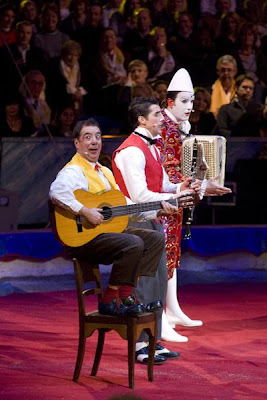 The video isn't about Slivers himself and doesn't lyrically reference anything about him or his career, I just seized the opportunity to portray him when director Joshua Katcher chose a dream-like vision of turn-of-the-century circus and sideshow performers to help illustrate the song's lyrics about a dark love triangle. Have you ever watched inexperienced performers absolutely ruin comedy material that you know could be brilliant in the hands of a more seasoned pro? This video best articulates how I feel when I watch some "clowns" steal a bit that they've seen someone else do, with neither the performance skills necessary to pull it off nor the basic understanding of the material that made it work so well for those other performers in the first place. A young Eric Burck with Chris Allison on the Ringling Blue Unit. 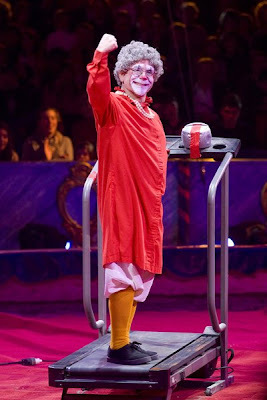 Chris just won as Audience Choice for Best Clown at Monday night's 2008 New York Downtown Clown Golden Nose Awards. 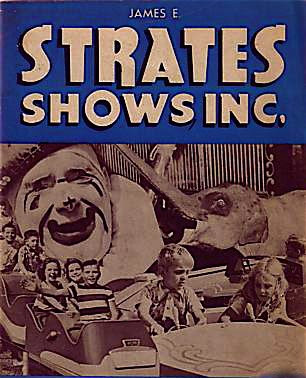 Longtime fixture of the Cole Bros. 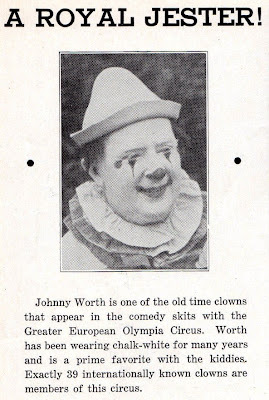 Circus Clown Alley, Horace Laird pictured here on the cover of a James E. Strates carnival program. 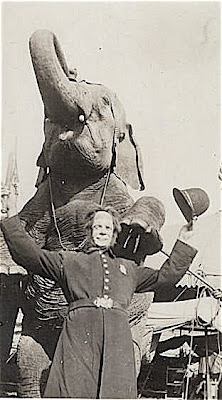 To see more of the wonders available at Bill's GIBTOWN CIRCUS DIME'S STORE on eBay, please click the title of this post. 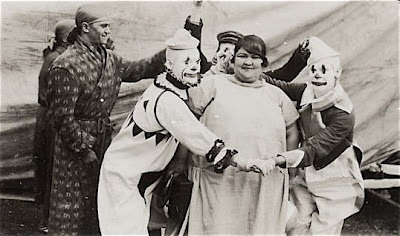 Al G. Barnes Circus April 3, 1926. The man in the back without a hat is heavyweight champion Jack Dempsey. Standing to next to Mr. Dempsey is Tarzan and John Carter creator Edgar Rice Burroughs, ringmaster for the day. 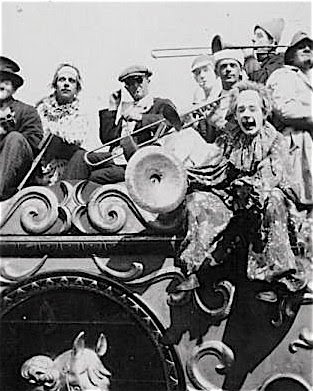 Also pictured lower right is Herbert Rawlinson (film actor). 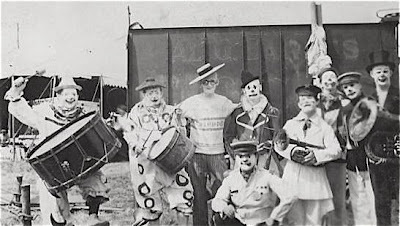 Lawrence "America's Neatest Clown" Swalley is the clown sitting down on the lower left and Glen "Kinko" Sunberry is the one wearing a top hat in the upper right. 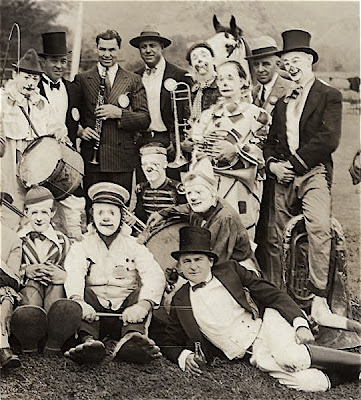 Does anyone else think that a young Larry Cross may be the clown seated between Smalley and Rawlinson? 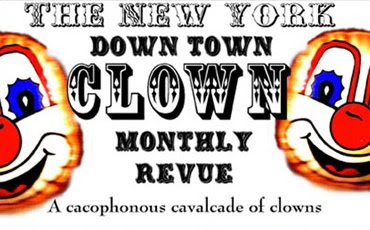 NEW YORK DOWNTOWN CLOWN: 2008 Golden Nose Award Winners! 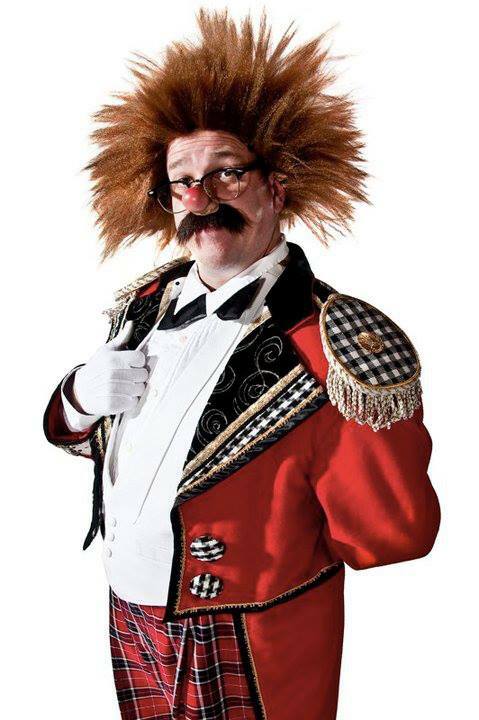 Keith "KInko" Nelson of The Bindlestiff Family Cirkus. 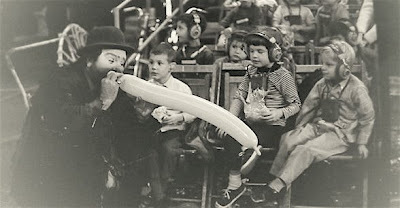 The Brick Theater, producers of the New York Clown Theatre Festival. 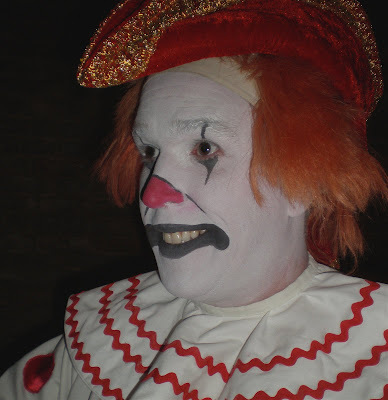 Belated congratulations go out to Adam Gertsacov (of the Acme Clown Company) and his beautiful bride Stephanie on their April 5th wedding in Yonkers, NY. 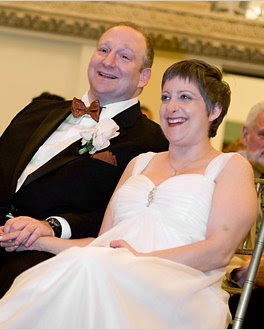 Please click the title of this post to read an article about them that appeared in the New York Times as well as enjoy a video interview with the happy couple. 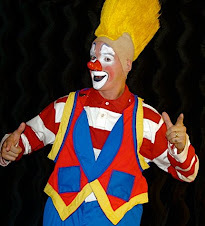 To visit Adam's CLOWNLINK.COM, please click here. 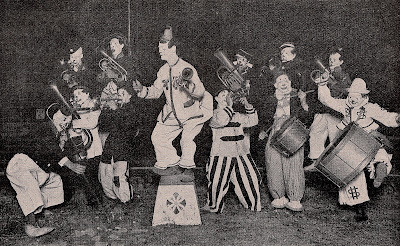 Members of the Sells-Floto Clown Alley in 1921. TONY GRICE JR: Influence on Pepito? 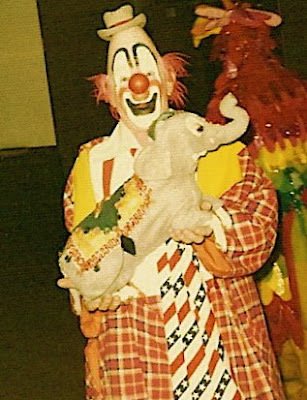 Carnival Plaza in Toyko, Japan 1993. 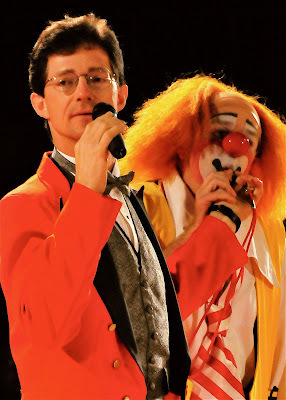 Here's a shot of me blowing the Ringmaster's whistle, held by John Moss III, signalling the start of the 2008 edition of the Kelly-Miller Circus in Palmer, TX on March 28th. 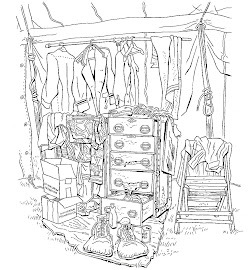 I just got off the phone with Rex "Count De Boxcar" Young. We had a wonderful conversation about Rex's career and have plans to meet up in a few weeks when I head up his way for some dates in Milwaukee. Otto Griebling is again singled out as being the best of the best. Otto and Freddie Freeman would have disagreements and not speak to each other for weeks, all the time doing their Boxing Gag together two or three times a day! 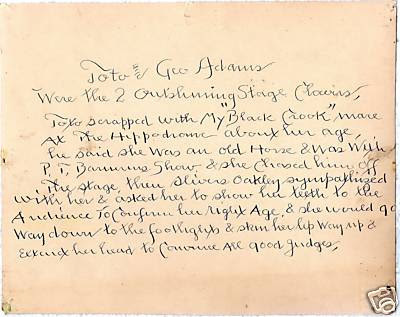 Poodles Hanneford and Joe Jackson were the best of friends. 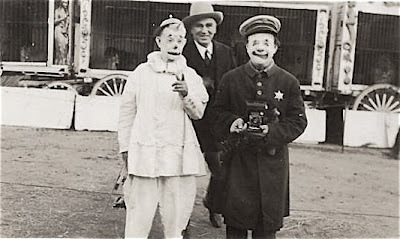 Poodles would not accept a dime from Rex for working the car act with him. Rex eventually got Poodles to agree to being paid a box of cigars a week. 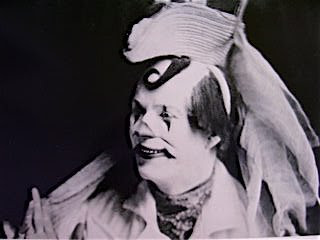 While in Berlin famous bicycle clown Joe Jackson gave his Hinderburg tickets to fellow comedian Ben Dover. Dover narrowly escaped dying in the crash by leaping to the ground and breaking both ankles. For the rest of his life Joe was deeply beholden to Ben for saving his life as there is no way that Joe would have been able to save himself from the horrible disaster that way. Interesting stuff and I look forward to sitting down and meeting Rex face to face and getting his memories down on video. 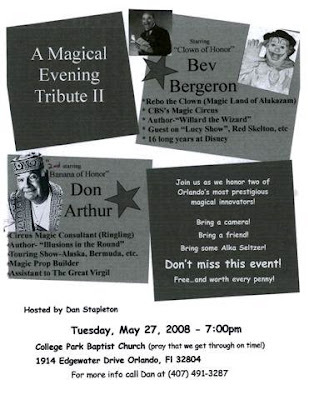 Anyone who remembers Bev as TV's Rebo the Clown or his years with Disney World's Diamond Horseshoe Revue knows just how much he deserves to be panegyrized. 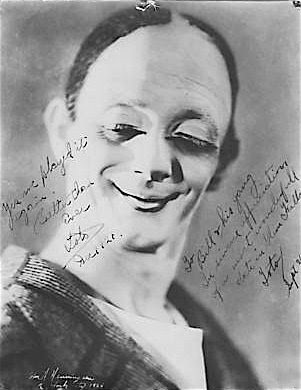 Another unusual video of the great George Carl. It's narration is in Russian. It uses the music of Uriah Heep in the background. And my headshot appears in the lower left corner throughout. Can anyone out the translate the narration for me? 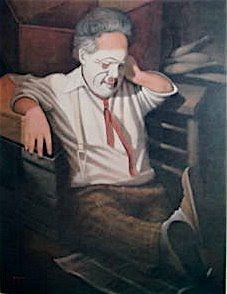 Jim Howle's masterful portrait of Mr. Frankie Saluto. Wanna know how many sweet board hits you can cram into one gag? Watch and learn from this Greg and Karen DeSanto directed gem! The Burck boys with Jimmy and Brenda Graham and Kevin "Nasty" Thompson who were recently seen with the Grahams' daughters in an episode of MTV's "True Life".